After their migration from Lynn, Massachusetts in 1640, the proprietors of Southampton, NY set aside one acre of land for a burying ground. It is thought to be the oldest cemetery in New York laid out and used by an English settlement. It is probable that the Old Burying Ground contains all of the remains of the first and second generations of settlers. Because the burying ground was located some distance from Southampton's Main Street, a right-of-way was granted over the property of James Herrick in 1665. In exchange for this use, Herrick was given a piece of property abutting his parcel and extending eastwardly. No records are preserved of what transpired in the Old Burying Ground in those early years. But in 1721, the Trustees set apart an additional burying ground now called the North End Burying Ground because the older burying ground was full. Although there appears to be no written record, the Old Burying Ground had been earlier expanded in size to approximately one and three quarter acres. For the next 100 years, some burials may have continued there, presumably in family plots. But the Old Burying Ground had become over-grown. In 1864, a reporter wrote that "few monuments now remain and these are so completely hidden from sight by brambles, that our explorations involved almost as much strength and risk to skin and clothes as would be required to force our way through a Mexican chaparral." He noted that the oldest monuments were those with no date, name or trace of the sculptor's tool - mere blocks or low posts of hard stone - showing simply by their presence where the "rude forefathers of the hamlet sleep." The trial eventually established that Edwin Post had trespassed on the Old Burying Ground and was ordered to stop and pay six cents, plus court costs. We do not know how many grave markers survived the leveling of the land, but by the early 1910's, Town Historian Lizbeth Halsey White reported that only 59 remained. 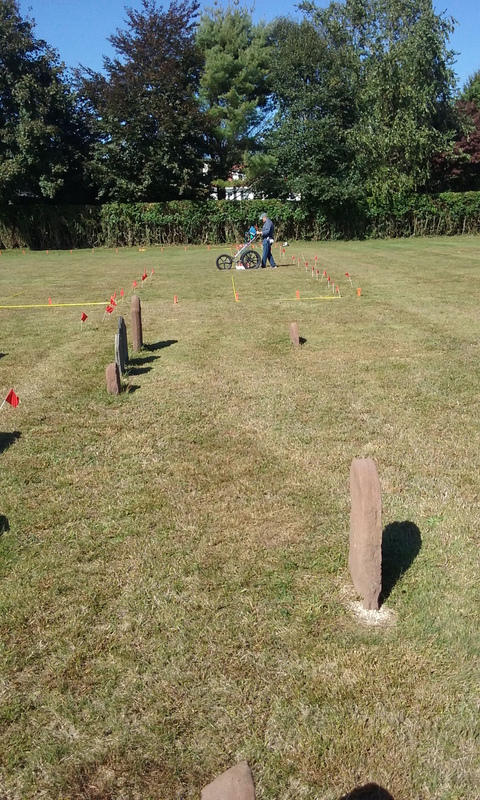 In 2016, the Town’s Historic Burying Ground Committee had a Ground Penetrating Survey performed on the Old Burying Ground. The purpose of the survey was to estimate the number of graves which the site contained. Based upon multiple transects, it was found that the burying ground may have at least 1,700 graves. Only 48 headstones remain; the original one acre burial ground has 44 markers, while the 3/4 acre area that was added later contains only four.